Lewis Herbert pictured in his sensory garden following a campaign launched by his parents, which raised thousands of pounds. The dad of a Northampton teenager who requires round-the-clock-care is set to go completely sober for a year and take on a mammoth 1,600-mile run to fund his son's ongoing appeal. Lewis Herbert was diagnosed with West’s Syndrome at three months old, which then developed into Lennox-Gastaut Syndrome (LGS) - a rare form of epilepsy which means he can have more than 100 seizures every day. Lewis' dad Gary is stopping drinking to raise money for his son's ongoing appeal. 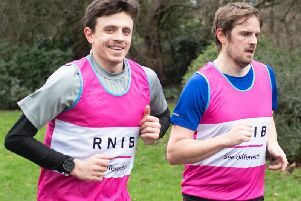 This year his dad, Gary, is running 1,600 miles and going sober for one year to raise money for the Life of Lewis appeal, which has so far funded a sensory garden for the teen and a wheelchair-accessible front door. The new funds will go towards a new loft conversion to allow for extra storage for Lewis' vast amount of medical supplies, as well a new specially adapted manual wheelchair suitable for his scoliosis and curvature of the spine as he grows. Gary said: "With Lewis approaching the age of 16 in November, I have decided to set myself my most demanding personal challenge ever. "Lewis fights every day to stay alive and is in his sixteenth year of doing so. I've just promised him I will attempt to run 1,600 miles in a year from September 2018 to September 2019, which is 100 miles for each year of his life." This equates to an average of 133 miles for every month of the year, 33 miles every week, and an average of five miles every day, for a whole year. He added: "I honestly don’t know if I am going to complete the miles in a year as there is a lot of luck involved with regards to an injury, purely due to the sheer volume of miles involved. "It will be relentless and I will have no time to rest my legs, but I am going to give it everything I have to complete 1,600 miles in one year." As well as this pledge, dad Gary has also promised to go sober until September 4 this year. "Those who know me well know that alcohol is my big Achilles heel, and something that affects my mental health greatly. "This challenge alone is going to be extremely difficult for me to stick to. "This double challenge will be by far the hardest and most challenging thing I have done to date, but I’ve promised Lewis so there's no going back now. Even this doesn’t get anywhere near to what Lewis endures on a daily basis." At the time of writing this appeal has raised almost £7,000. If you want to donate, click here.